Continuing our feature Getting Spiritually Better, we offer below the fourth instalment. We hope you like it, and would share it with others who are interested in enquiry and self-improvement. Do write and tell us what you think, how you find it, whether it is useful, and in what ways this feature can be improved. In an earlier issue, we discussed the question of spiritual balance. Presently, we shall look at that issue in terms of education and educare, especially in the light of the great importance that Swami attaches to educare, the conferences that have been held and continue to be held on educare, and the stress on educare that is constantly being laid in the Organisation. We begin with what Swami Vivekananda said over a hundred years ago. He made two important points and both of these have been elaborately stressed by Bhagavan in recent years. Vivekananda said that education must bring out the Divinity latent in man. He also pointed out that humanity's thinking has been shaped by two great streams of thought and philosophy. One originating in Greece drew people into the outside world. This in turn led to exploration, advances in science and technology and all that. The other stream of thought originated in ancient India, and sought to take man deep inwards. As scientist David Bohm remarks, the Western Approach is analytic and tries to understand the whole by breaking it into parts. The Eastern Approach, by which is meant really the Indian Approach, is holistic. Vivekananda says that what modern society needs is a good and practical blend of the two schools of thought. 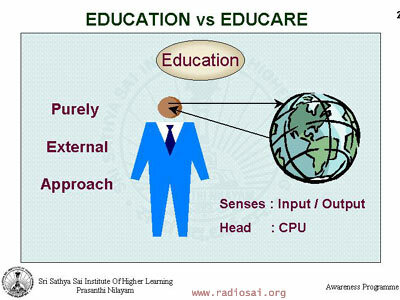 Let us now see how Swami describes this blend in terms of what may be called education and educare. Education is the name given to the knowledge that one acquires about the external world. This knowledge is acquired, among other things, through our senses. Educare, on the other hand, relates to the knowledge about our Inner world. This knowledge has already been deposited in our Heart by a loving and merciful God. This treasure is His gift to us. It has been given to each and every individual, WITHOUT ANY EXCEPTION. EDUCATION: MIND SHAPED BY EXTERNAL FORCES. EDUCARE: MIND SHAPED BY THE DIVINE SOURCE WITHIN. IN THE CASE OF EDUCATION, ACTION IS INFLUENCED AND DETERMINED SOLELY BY THE EXTERNAL WORLD. IF EDUCARE IS THE FOUNDATION, THE INTERNAL FORCE GENERATED BY SATHYA, DHARMA AND PREMA ALONE DETERMINES THE ACTIONS PERFORMED IN THE EXTERNAL WORLD. EDUCARE: DIVINE PHILOSOPHY [LOVE ALL, SERVE ALL]. 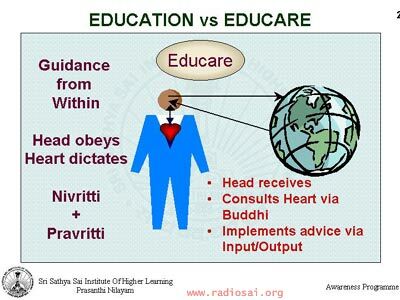 FINALLY, EDUCATION IS FOR THE HEAD, AND EDUCARE IS FOR THE HEART! Incidentally, the word educare has its origin from the Latin word 'educare' [pronounced edukare], meaning, to bring out or develop from latent or potential existence. On our context, it means bringing out the Divinity latent in the person. The question arises: "Why suddenly EDUCARE? Why was it not there before?" The answer is the following: Earlier, the forces related to educare were working silently, implicitly and unobtrusively. There was morality in the home, morality in the school, morality in the work-pace, and finally, morality in the community also. Today, the situation has changed completely. God has been put on the back burner so to speak. Therefore, an entirely different strategy and set of priorities are called for. We have to first invoke God strongly and then only move on to other matters and business. Just look at the recent happenings in the Corporate sector for example. All of a sudden, one is hearing of scam after scam, and how greedy executives at the top have been taking the public for one huge ride and swindling money, millions of dollars if not billions. Commenting on this spate of corporate fraud, one pained teacher of a business school asked, "Whatever happened to old-fashioned ideas of honesty and integrity?" They got thrown out because people thought they were old-fashioned - that is what happened! Who wants honesty when one has to compete severely in order to survive? The recent massive collapse of corporate morality is enough to drive home the importance of morality in Society. And how does morality come about in a Society? Swami has the answer. He says first there must be Love for God; next there must be fear of sin. Given these two, morality would automatically prevail in Society. That is what was happening all over the world till even the middle of the 20th century. Then technology began to run away, consumerism began to swell, and greed began to grow without limits. Given all these factors, the crash was inevitable. The tragedy is that even now, the lessons are NOT being learnt. Leaders warn that CEOs must be honest. Legislatures pass bills calling for severe penalties for fraud. But can lectures and acts of parliaments produce honesty? Morality comes from within! And it has to be fostered the way Swami has indicated. How many schools have time set apart for moral instruction? Do the press and TV bother to keep out undesirable news? Do they make any effort to publicise honesty? No; the standard argument is that honesty is not 'news' whereas robbery, crime, scandals, etc., are. This raises a fundamental issue of rights versus responsibility. Once upon a time, responsibility was considered over-riding but these days everyone is concerned more about rights than about responsibility. Practical Dharma is all about discharging one's responsibility. How can people be expected to behave in a responsible manner when Dharma is hardly ever mentioned, while rights are stressed all the time? In this respect, the media has become a law unto itself. Let us go back to education versus educare and see how the two together can lead to balance in daily life. Swami says that a human being is a combination of the body, the Mind and the Atma - he is thus an MBA complex! Here, we shall use the words Atma, Heart, and Soul interchangeably. A person who ignores the Atma/Soul would be guided entirely by his body and his Mind. The senses would feed information about the external world to the person concerned, and the person would react to situations based entirely on the dictates of his senses and the impressions coded into his mind/brain. This would be true of even a highly-educated person who is totally Heartless. His actions and decisions would never show even the slightest trace of any compassion. He would always be guided by selfishness and self-interest. The two words that Baba often uses in this context are: SWAARTHAM [selfishness] and SWAPRAYOJANAM [self-interest]. To make matters explicit, let us consider a doctor. Let us say that this person knows nothing about Inner Divinity, human values, etc. He is very intelligent, has passed with laurels from the medical school, and is a great surgeon. He is shaped entirely by the external world. He is very proud of his skill, is keen on earning name and fame, and of course also a lot of money. Such a doctor would never think of going near a patient who cannot afford his fees. This is not an imaginary scenario. There are innumerable examples of such doctors these days. This is what happens when a person receives only education and has zero exposure to educare. On the other hand, there are many doctors for whom saving a life is more important than making money. These are people guided by their Heart rather than their head. In short, the external world applies a force on man, compelling him to conform, keep up with the Joneses, etc. The Heart, on the other hand, directs man's attention to the SOURCE as Swami puts it, and arouses feeling of compassion etc. In a good man, the Source overwhelms the Force [due to the external world]! The EHV program avidly promoted by the Organisation is nothing but a balanced diet of educare plus education. It is important that educare is seamlessly blended with education, and is not offered as an appendage stuck with tape as an after-thought! A few examples are in order. Say there is a course on molecular biology. The technical part of the course would naturally deal with genes and all that. But along with all that scientific stuff, the students must also be given a strong dose of the ethical issues involved in genetic engineering, cloning, etc. Say there is a course on the environment. The students must be taught not only about the physics and chemistry of the biosphere, but also about the dangers to it thanks to pollution etc. Further, there must be special stress on how all this can be avoided by curbing desires, and resorting to a model of sustainable living and development. In every sphere of human endeavour it is necessary to temper worldly knowledge with spiritual overtones. Swami often states this in terms of two words: NIVRITTI MARG and PRAVRITTI MARG. The former means the spiritual path and the latter means the worldly path. Swami adds: "When you walk, you use both feet and not just one. It must be the same in life. You walk concurrently in the spiritual and worldly paths. It means that you perform worldly actions like teaching, nursing, cooking, piloting an aircraft, or whatever. But spiritualise all your actions by thinking of God and offering it to Him". This is what is meant by hands in Society and head in the forest. You may get a salary for the job you are doing - for example as a teacher. But do not do the job thinking of the salary and promotions. Do your best as a teacher with the good of society in your heart. That would amount to achieving a good blend of education and educare. Shakespeare talks of tempering justice with mercy. The judge administers justice based on his legal training - that is education. But the feeling of mercy flows from the Heart - that is educare! The Mind is the seat of all knowledge. One input is connected to the external world. It brings knowledge about the world. The other input is connected to the Heart; it brings feelings from the Inside. In earlier times, it was 1) LOVE FOR GOD, and 2) FEAR OF SIN. These automatically lead to MORALITY in Society. On account of his love for God, the individual was moral. Individual morality then led to community morality. In olden days, people in all societies and communities believed in being honest, helping each other, etc. Thus, there was morality in the home, in the school, in the workplace and in the community. Hence, there was no special need to EXPLICITLY invoke Educare. Fifty years ago, normal education, i.e., subjects like history, geography, economics, etc., were taught without any special reference to morality. There was no need to, because morality was a part of the general ambience. In other words, Educare was built into daily life, and no special reference to it was necessary. Lord Nelson said: "England expects every man to do his duty." Shakespeare said, "Above all to thine own Self be true!" Thus, truth and duty with sacrifice were the accepted norms. Prior to the advent of the media on a large scale, in every house, the children listened to the advice of their parents and conducted themselves properly. When children got together, each of them brought with them a moral armour. And together, they upheld morality. Today, things are very different, as the graphic below shows. Parents may advise their children but when boys and girls get together, they are lured by the attractions paraded by the media. The media has thus become a very powerful disturbing force. First it was the books and the magazines that pandered to a low taste. But then, not everybody could read. Then came the movies, and even the illiterate could be easily mislead to the path of bad ways. But one could not see movies all the time, and that was a bit of saving grace. Now there is the TV which spread poison all 24 hours. That is why Baba refers to Television as TELEVISHAM - visham means poison! True there are some good programs but which parent finds the time to carefully steer his or her children through the nonsense that pours out from the idiot box? SCIENTIST: There is no God! POLITICIAN: Political power is the greatest thing; it gives both power of patronage and leverage. BUSINESSMAN: Money is the ultimate power. With money, one can buy anything! BEAUTY QUEEN: Glamour is the greatest thing. ROCK STAR: Being a hero is the greatest thing! MEDIA: Have a ball! Live like there is no tomorrow! Buy! Keep buying all the time! Consume without limit! Life is meant to experience excitement. This kind of barrage makes humans slaves to the six famous enemies that are worse than deadly serpents. They are: KAMA [desires of various kinds, including lust ], KRODHA [anger], LOBHA [greed and miserliness], MOHA [attachment], MADA [pride and arrogance] and MATSARYA [jealousy]. To these six may be added two more: AHAMKARAM [ego], and MAMAKARAM [sense of mine, or possessiveness]. Man is deluded into welcoming these serpents as honoured guests! Speaking once to students, Swami said that man welcomes these demons and, extending hospitality, asks, "What would you like to drink? Tea or coffee?" That is how gullible we are made by external propaganda. Young people are all the time subjected to a barrage of falsehood. But no one has the time or the patience to guide them and correct them, both parents and teachers. The net result is that a wall is built on the road from the Heart to the Mind. When Buddhi is blocked and not allowed to play its role, then man is entirely under the control of external forces. In today's Society, God has been put on the back burner. The wall of ignorance built up by vested interests must be smashed like the Berlin Wall! WE MUST GET BACK TO GOD. THE ALMIGHTY MUST BE IN POSITION NUMBER ONE. MANKIND MUST FURTHER DEVELOP LOVE FOR GOD. PEOPLE MUST BE MADE TO REALISE THAT EVERYTHING COMES FROM GOD - THE EARTH, THE SKY, THE RIVERS, THE OCEAN, THE LIGHT, THE HEAT, ETC. AND THE PRIORITIES MUST BE AS SWAMI SAYS: 1) Love for God, 2) Fear of sin, and 3) the restoration of morality in Society. Swami says: MAN = BODY + MIND + ATMA; in other words, he is an MBA! Man must go through life in such a manner that all these three entities are in harmonious balance. However, today's lifestyle is such that man tends to totally ignore the Atma. Now the Mind has two major constituents, the lower Mind that looks outwards [drawn there by the senses], and the Higher Mind that looks Inwards, i.e., towards the Heart or the Conscience. Lower Mind + Body [inclusive of the senses] ? External world. Swami refers to this pathway as Pravritti Marg or the Outward Path. The Higher Mind [which is essentially the Buddhi], on the other hand, draws one to the Heart. Swami refers to the Inward Path as Nivritti Marg. The Inner Path is more important than the Outward Path. In today's parlance, INNERNET is more important than the INTERNET! At the same time, Swami is quite realistic. He says that since we live in the world, we cannot ignore the outer world and live like a recluse. What is required is a balance. He says that when we walk we use both feet; in the same way, we must go through life keeping both the Outer and the Inner paths in view. Swami gives beautiful expression to this idea in Summer Showers in Brindavan, 2000, p. 131. In other words, live in the external world but be guided from within. Education is incomplete unless based on fundamental values [Truth, etc.]. The true end of education is not a prosperous career but BLEMISHLESS CHARACTER. As Baba often reminds us, if character is lost, everything is lost. Without character, education can produce only clever devils! Eminent scientist Victor Weisskopf says: "[Scientific] knowledge without compassion is inhuman. On the other hand, compassion without knowledge is ineffective." Amplify the statement of Weisskopf, especially with some good examples. Important: Educare should not be interpreted as something intended merely for the classroom. Just as education does not mean learning merely in the classroom, so also, educare is a continuous process of drawing out from within, that goes on throughout life. Let us say there is a tribal living in a forest. Just by observing, he picks up a lot of information about his environment. He then codifies this information into his brain, forms patterns of knowledge, and draws upon this resource in times of need. Thus it is that tribals know how to read footmarks of animals, how to distinguish between poisonous and non-poisonous plants, where and how to hunt, etc. All this comes from self-training and self-education, via his parents, friends etc. In the same way, long before the child enters school, it learns a lot from its mother by watching and observing. In fact, the child learns an enormous amount, including a language! It would be a good idea to expose the child to values, and learn intuitively about educare, as indeed used to be done in the olden days. How? Basically, the parents must unobtrusively set an example. For example, the parents must always be smiling, especially when speaking to the child. They must never fight with each other, especially in the presence of the child. They must speak politely to all so that the child makes politeness a way of life. And so on. The important point to note is that intrinsically, no one is bad to start with; people only go bad in the interim. Hence, right from an early age, the child must be encouraged to bring out the latent goddness in every possible way; that really is what educare is all about. It is not something that is taught. The parent/teacher merely facilitates the emergence of what is already within. Senses drag the Mind to the outer world. That is but natural. However, in today's environment, the Mind can become an easy prey to the dangerous attractions in the of the external world, most of which are nothing but deadly poison though heavily sugar-coated. So there must be a counter force. That necessarily has to come from within, and the required training for that must start early. Construct examples like that of the doctor given above, relating to various professions/vocations like law, government administration, military service, business, industry, etc. In each case see what modification educare can bring about. Just imagine how different the world would be if people were guided in their decisions not merely by their educational training but also by the voice from the Heart! Why is it that people refuse to listen to their Heart? Duryodhana, the chief villain of Mahabharatha once said, "I know very well what is right and Dharma, but I simply cannot get myself to follow it!" How come? This is an important point because in today's world, it is often the brilliant people who are responsible for many of the ills that one sees in Society. In fact, one educator lamented, "Today's universities produce only clever devils!" Think it over. To see diversity in Unity is demonic. To be in harmony with diversity is human. To see Unity is diversity is Divine. Modern education pulls one to the level of the demon. Educare, on the other hand, raises on to the level of the Divine. Compile quotes of Swami that you think are relevant to this chapter.